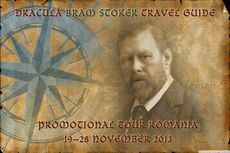 Our Dracula by Bram Stoker - The Travel Guide will lead you to the places where Bram Stoker lived and to the locations mentioned in his Dracula novel. Our manuscript is ready now, with Dacre covering the biographical aspect and Hans reporting on the locations mentioned in Dracula. Our book will present many new insights and hitherto unpublished details with a wealth of exclusive route descriptions, photos and maps. At the moment, we are talking with various publishers. We hope the book to appear soon and will update this website accordingly. We will guide you to the places where Bram was born and grew up, and picked a career which would lead him to managing the Lyceum Theatre and authoring Dracula. These chapters will show you how Bram's writing was embedded in his family life and social contacts. Moreover, we will lead you to the true location of the (fictitious) Castle Dracula, high up in the Kelemen Mountains. Equally, it will reveal the actual site of the mysterious Scholomance, where the Vampire received his education, at "Lake Hermanstadt". It will inform you about the life-time identity of the Vampire Count and explain why Stoker, in the end, did not want to connect his anti-hero to Vlad the Impaler at all! See the photo gallery about our November 2013 tour to Romania. 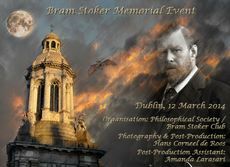 Here are the pictures of our March 2014 trip to Dublin and the Bram Stoker Memorial Event. 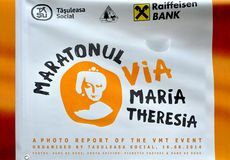 To the photo report of the Via Maria Theresia Event. Other exclusive features of this guide book are Mina's nightly route in Whitby, Chatham Street (Lucy Westenra’s first-mentioned London address), the village of Holmwood, the true model for the Count’s Carfax estate, the identities of Abraham van Helsing and his friends Vanderpool and Dr. Vincent, and photos of the churchyard in Hendon, appearing as the fictitious "Kingstead" in the chapters about Lucy’s tomb. In November 2013, we visited Romania together, joined by Aaron Sagers, a Travel Channel film producer and specialist for uncanny places. In March 2014, we were invited by Trintity College's Bram Stoker Club to participate in their Bram Stoker Memorial Event. In August 2014, Hans particpated in the opening event of the Via Maria Theresia near the Borgo Pass - one of the historical routes used by Jonathan Harker, Count Dracula, Professor Van Helsing and Mina. Read more about our joint trip to Romania in November 2013. See the Christmas 2013 issue of Letter from Castle Dracula, the official newsbulletin of the Transylvanian Society of Dracula (issue created by H. de Roos).